Fired FBI Deputy Director Andrew McCabe was fired on Friday. 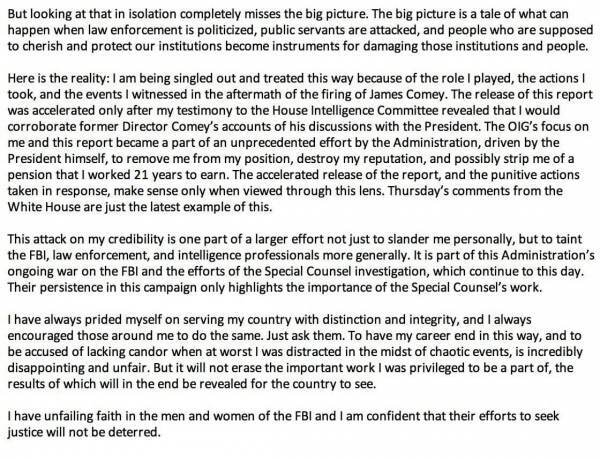 The former deep state official released a statement Friday night following the news . McCabe blasted President Donald Trump for tweeting about him and calling for him to him to be stripped of his pension. A representative for Andrew McCabe said he heard of the firing from the news media. Andrew McCabe and his attorneys were informed of his firing before the news media. The Department of Justice (DOJ) pushed back on a report Friday that former FBI deputy director Andrew McCabe learned of his firing from a press release. A DOJ spokeswoman told The Hill that “Mr. McCabe and his lawyer were informed in advance of the news media” after a representative for McCabe told CNN that the No. 2 FBI official learned of his firing by Attorney General Jeff Sessions through a press release. McCabe, who served with the FBI for more than 20 years, was fired Friday just two days shy of when he was set to retire, potentially jeopardizing his pension. McCabe had stepped down under pressure in January and was already on a leave of absence. 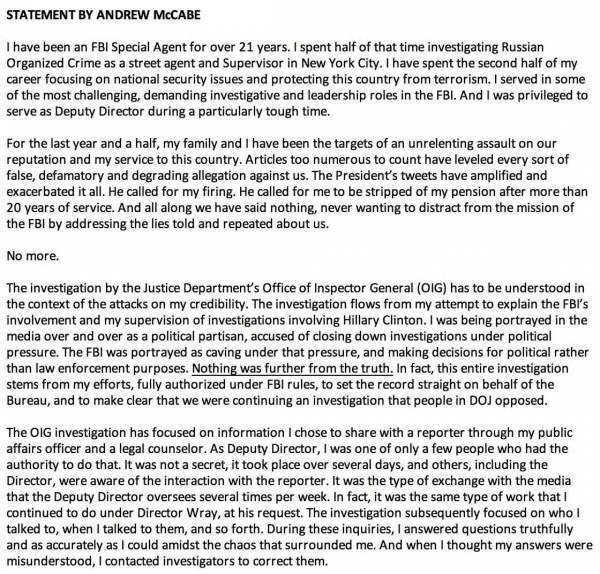 The post Another Andrew McCabe Lie Exposed: The Former Deep State Official Was Informed of Firing in Advance of News Media appeared first on The Gateway Pundit.